Lisa-Maria Rebelo is a remote sensing specialist by profession. She currently holds the position of Senior Researcher at the International Water Management Institute, part of the Consultative Group for International Agricultural Research. 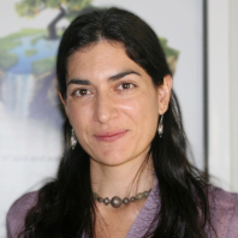 Lisa is also Co-Leader of the Information Systems research portfolio of the IWMI led Consortium Research Program on Water, Land and Ecosystems (CRP 5). Based in Vientiane at IWMI’s office for Southeast Asia and the Mekong since January 2012, Lisa was previously stationed in Addis Ababa in the IWMI office for the Nile Basin and East Africa, and prior to that, at IWMI headquarters in Sri Lanka. With over ten years’ experience in the field of natural resource management in Africa and Asia, her research is focused on the provision of spatial information for improved land and water management. In particular Lisa has extensive experience in the use of remote sensing for wetland inventory, assessment and monitoring, with a particular focus on wetland ecosystems that are used for agriculture. She is coordinator of the Wetland Theme of the International Science Team set up to support the Japanese Aerospace Exploration Agency’s (JAXA’s) Kyoto and Carbon Initiative. Lisa is also a member of the Ramsar Convention’s Scientific and Technical Review Panel, providing advice and support for remote sensing and GIS in the field of wetland science.